Millie Wilson, Untitled, 2013, transparency, light boxes, 11.5" X 14.5" each. LOS ANGELES, CA.- Maloney Fine Art presents Some People, a solo exhibition of new work by Millie Wilson. Millie Wilson has used the frame of the museum to propose a secret history of modernity, informed by queer subjectivity. She employs humor, parody and combined media to engage stereotypes of difference, and to question received ideas. The work presumes a place in the canon of modernist art, with the intention of revealing some of what is overlooked in the historicizing of the artist as subject and citizen. 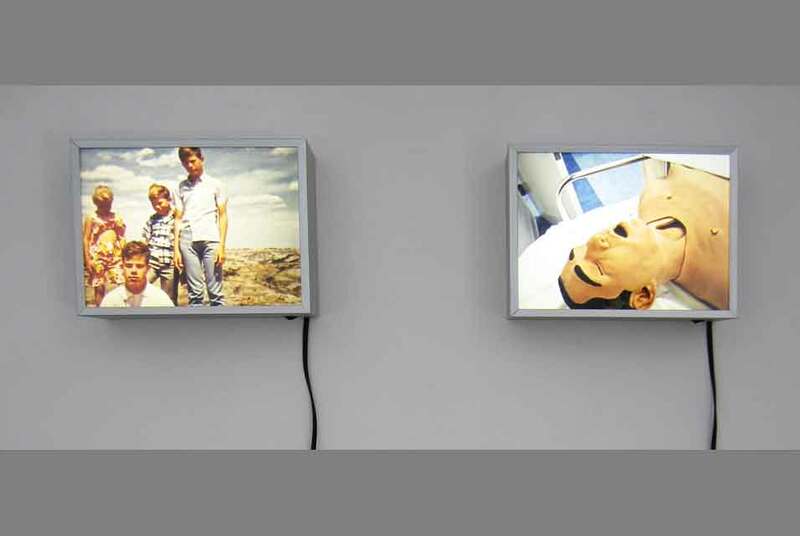 Some People presents a possible set of relations, suggested through telling details of vernacular color photographs, presented in small format light boxes. The pictures here are the third proposal in an ongoing series, which are selected from her large archive of over 20,000 found images. The grouping allows for a number of possible readings. These might arise from formal qualities, gestures and normative relations, and the friction among pictures of manufactured objects, gendered situations, anomalies and the everyday. She describes her installations as unfinished inventories of fragments, improvisational sites where the constructed and the readymade are used to question our making of the world through systems of language, knowledge, things and information. Select exhibition venues include the Whitney museum of American Art, Matthew Marks Gallery, New museum of Contemporary Art, White Columns, Walker Art Center, Carnegie museum of Art, SITE Santa Fe, San Francisco museum of Modern Art, Santa Monica museum of Art, Orange County museum of Art, the UCLA Hammer museum of Art, and Los Angeles Contemporary Exhibitions. The artist has received numerous grants, including an NEA Visual Artists Fellowship, a Pollock-Krasner Foundation Fellowship, City of Los Angeles Artist Grant, California Arts Council Fellowship, Art Matters, Inc. Grant, and a LACE Artists Projects Grant, has been published in a variety of contexts, and has taught and lectured throughout the U.S. and Europe. Millie has been a member of the Regular Faculty in the Program in Art at the California Institute of the Arts since 1985. Marlborough Fine Art presents artist Hughie O'Donoghue's "A Need for Gardens"